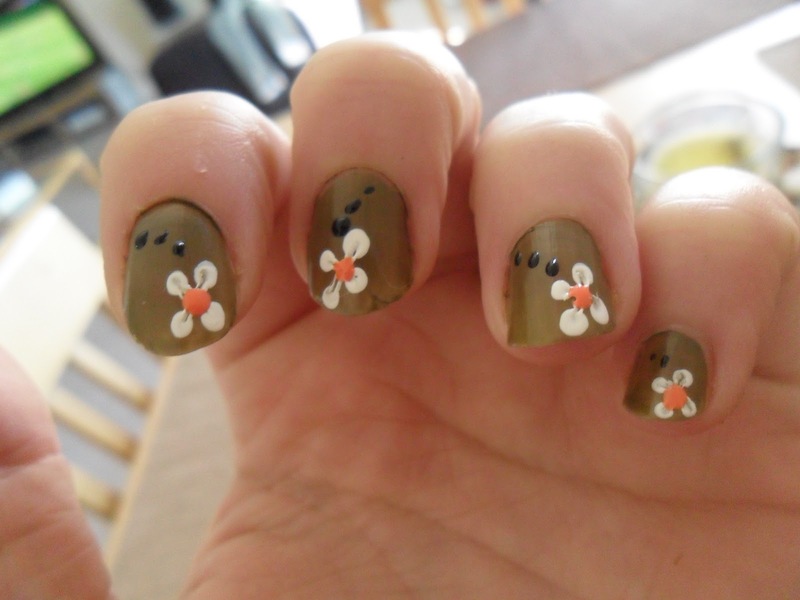 Well for those of you who read my blog regularly you will know that I am not to great at nail art, but I love it so much. 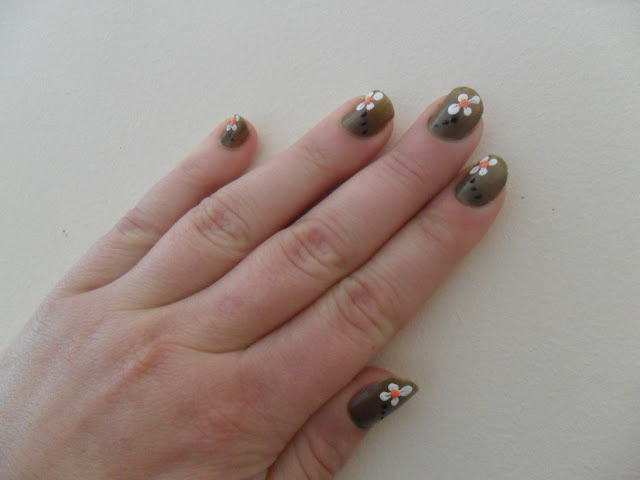 So I am teaching myself (very slowly) but here is an attempt at simple flowers to brighten up my OPI Uh Oh Roll Down The Window. Please excuse my finger second from the left, I broke it when I was younger and it now has a mind of it's own and bends in a different direction....weird I know! Now I know they aren't perfect but it's a start right? As I said the base colour is OPI Uh Oh Roll Down The Window and this is a lovely shade, for the whites of the flowers I used Sally Hanson Pure which I received in a swap on MUA and I am quite impressed with it, and for the middle of the flowers and the black dots I used some old polish I had from Boots. Considering it was my first attempt I was very impressed but my left hand was a different story by the time I got round to doing my left hand I had had a few glasses of wine and they were not the best so had to be re-done this morning. I am hoping I will get a lot better with time. This is really cute! I actually love the design and you executed it well! Great color choices! I have never broken my finger or hand, but my ring finger on my left hand (which is my photographed hand) bends in a weird direction too! I have to try my hardest to position my hand when I take photos haha! Thankyou that means alot coming from you the 'expert'! That is so weird, mine is my left hand to haha!